Over the weekend I traveled to North East TX (Piney Woods for the Texas folk) to visit my family. I usually spend most of the weekend on the road traveling between towns to see everyone, but last weekend I found the time to visit a local winery in Pittsburg, TX, called Los Pinos Ranch. I enjoyed a lovely butter lettuce salad with apples and goat cheese and tried the Vermentino, Viognier, and the Super Texican. 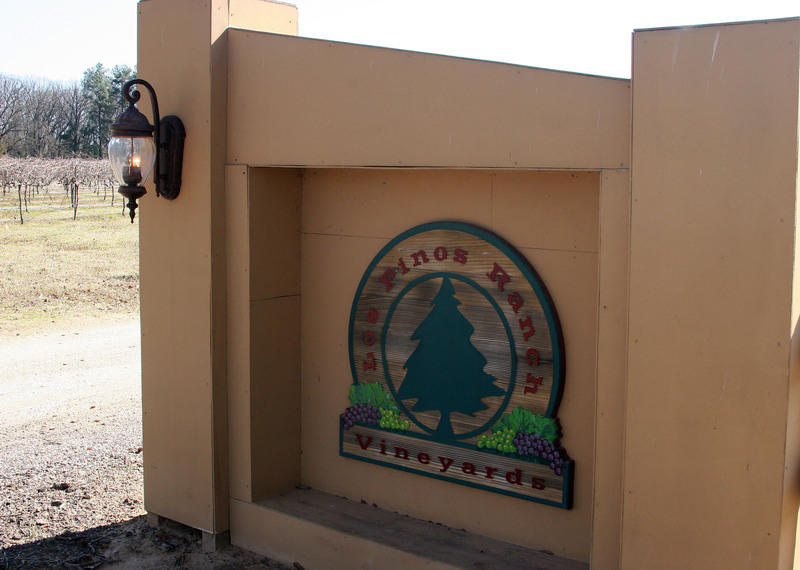 Los Pinos does produce wine from its own vineyard, but also produces wine from grapes planted on three vineyards in West Texas. They divide their wine into two categories: Sweet and Dry. I thought that was odd, but a lot of people I know like one or the other. I have to say that I did not care for the Viognier at all. There was too much fruit on the nose for me and I found the smell overwhelming. 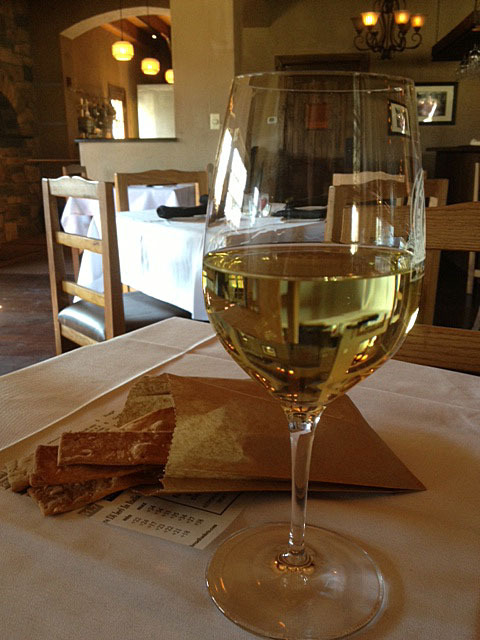 However, I did like the Vermentino and thought it was a softer, more enjoyable wine to sip. The best of the three was the 2011 Super Texican. The Super Texican is 50% Sangiovese and 50% Cabernet. I only had a tasting, but that will be the wine I order on my next trip! Los Pinos offers other small plates and wood fired pizza in the rustic, Tuscan inspired dining room. Live jazz is also a staple on Friday and Saturday nights. Unfortunately, I had to miss the live music. Because I visited the winery in the winter it was too cold to sit outside. East TX tends to be a lot cooler than Austin! It was unfortunate as the outside seating area is very nice. I can imagine the spring and summer will be gorgeous when all the greenery fills in around the estate. I am glad I had the time to stop by Los Pinos Ranch Winery. 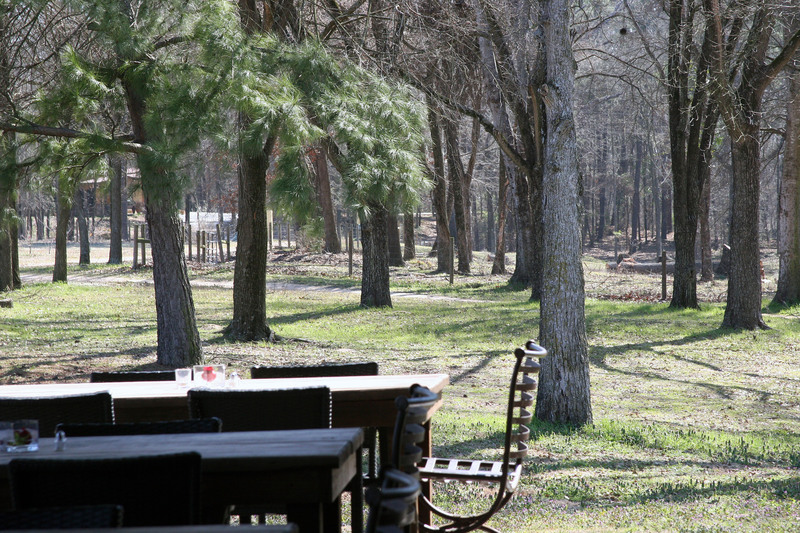 Los Pinos is relaxing, quiet, and definitely off the beaten path (two miles down a black-topped country road). In an area saturated with fast food and chain restaurants, it was nice to have a “real food” and wine option. Cheers to finding a new East TX destination! Why does food and wine make you happy? Sounds like such fun! I have a conference in Austin in the fall so I will be looking for some great places to explore! Looks like you definitely have some great suggestions! Thanks also for visiting my Tinkerbell blog! So appreciated! Hi there! Thanks for visiting as well! You will love Austin. It is such a fun city with great food. If you need ideas or suggestions just let me know! I’m sure I’ll be writing about more restaurants soon. I will definitely do that! That’s my favorite part of these conferences is exploring new places! Keep up the great blog!